With one night a year devoted to the American people to vent out their violent tendencies without fear of punishment, 2014’s The Purge had one of the most original premises for a movie in recent years, offering a mix of action and horror that carried the movie even if the story was just a rehash of siege movie tropes. The following year’s The Purge: Anarchy brought the action out into the open, with an entire city being the playground for all manner of violent acts for gore hounds to lap up, but showed that there wasn’t much more to the premise than that. 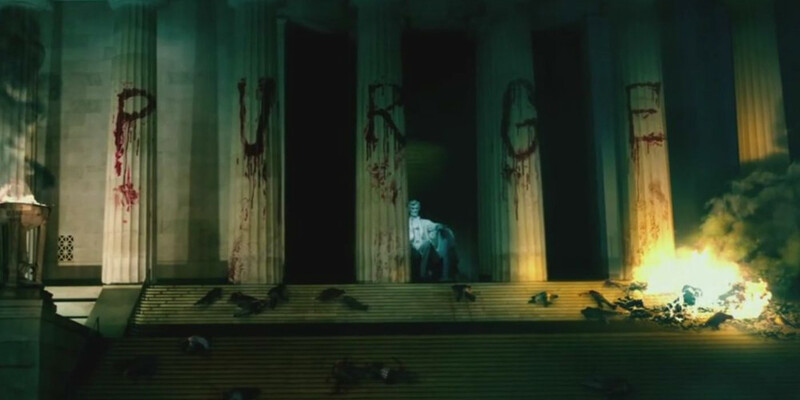 But the box office coffers runneth over for the franchise, and now we have The Purge: Election Year which ups the satire quotient of the other two by, as the subtitle suggests, making some timely swipes at America’s political system. Following the events of the second film, the true purpose of The Purge stands revealed: the unprecedented peace and prosperity it brings is a result of the rich wiping out socieity’s weakest and poorest, saving the government a fortune in health care and housing. It was a social commentary that ran underneath the action of the first two movies, but here it’s out there front and centre, and director/screenwriter James DeMonaco isn’t really subtle about it, ramming it down our throats during the opening minutes. It forms the back bone of the main plot, which sees one of the heroes of Anarchy, Leo Barnes (Frank Grillo), as head of security for idealistic politician Charlie Roan (Elizabeth Mitchell), a U.S. senator running for President on an anti-Purge platform. With her popularity on the rise and this year’s Purge looming, the masterminds behind the annual, legalised bloodletting, the New Founding Fathers, are understandably not happy, and without any tact whatsoever repeal the rule that makes political officials exempt. This, of course, leads to an event filled Purge night for Barnes and Roan as they must survive twelve hours of murder and madness. As with the previous movies, DeMonaco has a great handle on the execution of his concept, presenting disturbing images, like a car’s bonnet piled high with screaming victims and famous Washington landmarks smeared with blood, that go a long way to unnerve the audience. Unfortunately, he’s forgotten that satire needs some humour, no matter how dark, in the mix, and the biggest problem with Election Year that it takes itself far too seriously, save for one more moment where the characters call out the more ridiculous elements of the concept. 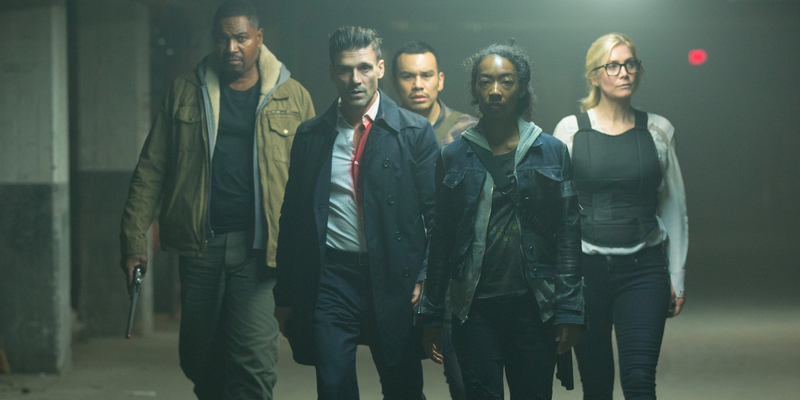 The movie is just going through the horror thriller motions as an ensemble of disparate characters, including Mykelti Williamson’s shop keeper and Betty Gabriel’s EMT, intersect with Roan and Barnes as they desperately try to fight their way through the city. The cast try their best, with Grillo, last seen as Crossbones in Captain America: Civil War, proving to be a strong lead and more than able to handle the action tropes thrown at him. Mitchell, on the other hand, can’t really muster the dramatic chops, or indeed interest, needed to make Roan a likable and believable character. The rest of the cast don’t add much more, with Williamson in particular just there to spout some ill advised one liners. Once the siren sounds the beginning of The Purge, the narrative becomes a series of run ins with murder minded rich folk in elaborate Halloween masks. It adds nothing new to proceedings, quickly becoming a rehash of the previous two movies, and the lack of a believable central villain hurts it even more. The NFF act as the de facto bad guys I suppose, but their presence is barely felt, and the group of neo-Nazi mercenaries sent to eliminate Roan are barely more than ill-defined canon fodder, leading to a finale that just falls limp. I still love The Purge as a concept, but Election Year proves there needs to be more more to it to sustain a franchise.